I’m not nearly alone in saying this, but David Lynch has been a formative presence in my years of cinephilia. Showing up late in the game, my introduction to the man’s diabolical nonlinearity, noir-drenched melodrama, savage humor, and inhabited psychology was Mulholland Drive. It was a milestone in my appreciation of the medium. It was the first time I asked myself… what just happened? So obviously I went back to the theater the next day and saw it again…and again. Through a peculiar cinema, Lynch admitted to me something that few other filmmakers have been able to with as much gravity, generosity, or sympathy; that our senses lie to us, that our memory is a circuitous and mutating Kaleidoscope, that emotions can color our entire person, and that these filters combine with our lens for experiencing the world…a place that contains as much brilliant white light as it does the most opaque blackness. From Mulholland Drive on it was love, and only a matter of time until the remainder of his oeuvre was being safely tucked behind my eyelids… that is to say, except for a little (not so little) show from the early 90’s that – with only 2 seasons to its credit – garners nearly as much of a cult following as the X-Files did in its 9 year run. 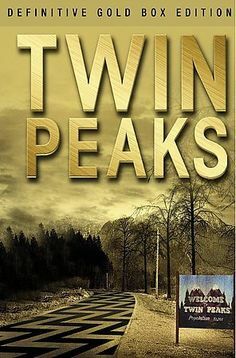 For those yet new to Twin Peaks, it is the story of a small rural US town in Washington State shaken by the murder of its most unquestionably beloved, the young Laura Palmer (Sheryl Lee), found dead wrapped in plastic on the banks of a lake. Special Agent Dale Cooper (Kyle MacLachlan) of the FBI arrives in town to investigate the murder and its possible relation to another. Kyle MacLachlan plays the role he was born for (aside from his recent stint as the mayor of Portland[ia]). His combination of earnest regard, humanity, humor, and intuition is such a treat. His openness to the absurd or obscure is matched only by his compassion and dedication to procedure. What Cooper discovers is a local population teeming with secrets, abounding in quirks, and hometown values side by side with the utmost evil. It is a joy to ensconce in the specificity of this world with Lynch as our guide and Cooper as our vessel, who finds himself falling in love with the town despite its hazard. 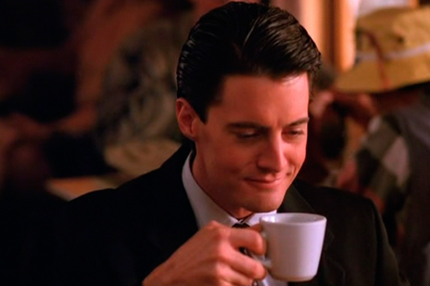 There is a warm feeling that radiates from people when you ask them, “have you ever watched Twin Peaks?” The biggest smiles come from those who watched weekly on its original airing. They seem to fondly recall having been transported by a strange and unlikely show that somehow stitched itself into the fabric of the American psyche…perhaps because it reflected a landscape both familiar in its alien-ness / and alien in its familiarity. No matter the terror there is a stirring beauty inside that distortion that the American audience latched onto. This gets to one of the functions of horror, to manifest extant anxieties and solidify them in the vessel of monsters and shadows so that we might reach catharsis in knowing their form. Lynch takes the thin veil we have used to shroud our darker selves and our more frightening spaces and shows us the monster that can be extant within us. He reveals that form is a falsehood, is an emptiness, and comfort may not be found in naming it. Laura Palmer represents a still precious American idealism, that of the unselfish virgin; A beautiful blonde homecoming queen who’s dating the captain of the football team, runs meals-on-wheels, and visits the mentally handicapped. She is a bright light of hope, or rather a canvas upon which hope and light are projected. But a canvas is just a surface. Laura Palmer is full to the brim with secrets. And what have we done to our perfect ideal but broken it inside, and poisoned it with misdeed and diversion? I think Lynch and Frost would reject absolutes or that they intended toward metaphor, but it isn’t hard to draw Laura’s murder investigation and the Cold War – which had all but ended at the inception of Twin Peaks – into conversation. The density of secrets, the wages of psychological and proxy conflict are all present in the world of Peaks, as they were in five decades of nail-biting “who blinks first” tactics of international war, not to mention the witch hunting among neighbors. The hearts and minds of American’s (indeed all citizens of the world) were at the frayed ends of sanity by 1990. Perhaps Peaks presented a timely significance because it was able to abstract and also distill something honest about an emotionally embattled American society willing to look at its own reflection again…its shadow self…and wonder what had happened. Peaks unfolds in a primal setting, amid Owls and Douglas Firs. Perhaps it also represented the anxiety of a world that needed to reset itself, to return to an origin and emerge either good or evil. Or maybe its just unadulterated fun. …Discuss. In some ways I am glad to have waited all these years. I was able to enter into this strange and expansive universe, and relish the details that ripple in both directions along the timeline of Lynch’s creative career. I’ve done so with the Definitive Gold Box Edition released by Paramount in 2007. 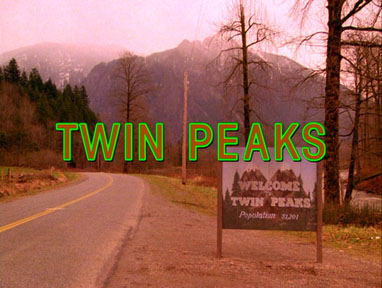 With picture and sound restored to perfection, each episode with optional Log Lady introductions, no commercials, and some damn fine supplements, this initial excursion into the seemingly banal yet unfathomably dark world of Twin Peaks was a richly appointed one. It allowed me to obsess to the necessary degree…fully. What attracts me so much to Twin Peaks, more than the dark mythology it patterns, or its rich moods, or the dynamic emotive score by Angelo Badalamenti, is its varied success in blending three genres; soap opera, noir, and camp comedy…with a splash of 1950’s teen pulp. This blend, especially the flourishes of melodrama, has much to do with Mark Frost, who co-created and co-wrote Twin Peaks. Lynch often gets sole credit for the show, but Frost is truly an equal partner in its vision. Shortly after Twin Peaks, the two would again collaborate, this time on an unfortunately very short-lived sitcom called On The Air (1992), which is something like 30 Rock presaged by about 15 years and taking place in 1957. Though Peaks borrows from Lynch’s Blue Velvet in its shattered veneer of suburban idyll, and “going below the surface,” it sets in motion the more rigorous psychological / metaphysical direction Lynch would thereafter take in cinema, from within psycho-existential states, ie: dreams, afterlives, fugues, etc. Peaks also plants thematic seeds that would recur in his later works, those of multiple selves used to articulate a whole individual, of the body, mind, and physical spaces as literal containers of emotion, and of consciousness as the ultimate subversion of time and space. Season one of Peaks is virtually a perfect creature. Prior to diving in, I encountered many a rumor about the second season’s …inconsistencies. I should say that, although I detected the waning influence of the show’s creators toward the middle of the season when they were distracted by film projects (Wild At Heart, Storyville), I remained as ravenous to consume that universe for which I had only love. After a short period the show regains a sense of it self and goes for broke until the finale. And boy howdy…what a finale. From then, you have only Fire Walk With Me to satiate your hunger to remain in the Peaks universe. FWWM is Lynch’s feature length prequel to the series. It is a different flavor than the show, for which many people have voiced disenchantment, however the flavor is necessarily thus. The film reveals Laura’s last days and is more explicit, where Peaks is implicit in terms of sexuality and violence. FWWM is the secret, the series is the secret being sought and ever more being uncovered. I found FWWM to be a powerful film, and intense in a way that may only have been so unsettling because I had the series in my blood. FWWM is also more attuned to the types of abstraction that Lynch’s later works would exploit to complex and yet cogent ends. *warning* It is highly recommended that FWWM be seen after the series, as it was intended. And for the sake of the sanctity of your experience, DO NOT google Twin Peaks images. You WILL see something that ruins the entire ending of the series. I did it to myself. Lastly, stockpile donuts and coffee… you will want them more than you ever have in your entire life. I went from a few cups a week to 3 cups a day. This was a great rundown/review of one of the most seminal David Lynch themes of all. I think it’s wonderful how well Lynch is able to perfectly articulate what he was going after even if it is a place both “wonderful and strange”. This will be a great resource for linking people to, that don’t know about the glories of this show! !